I found it wasn’t necessary to add all the oil that the recipe called for, so I cut the oil content from 6 tablespoons to 3. Feel free to add more oil if you wish. The cookbook says to let the squash cool before serving, but I changed the order of the preparation so I could take the squash out of the oven last and serve it hot. 1. Set the oven temperature to 350F. Sprinkle the seeds and nuts on a baking sheet and toast for 8-10 minutes or until slightly browned. 2. To make the sauce begin by placing the eggplant over a flame – on your stove-top if you have gas, on a barbecue if you don’t, and in the oven if you have neither of those. Burn the eggplant for 12-15 minutes, turning with tongs from time to time. The skin should be dry and cracked, and you should smell a smoky aroma. If you do this in the oven it will need a much longer cooking time. 4. Stir together the eggplant, yogurt, oil, pomegranate molasses, lemon juice, parsley and garlic. Mix together and add salt and pepper to taste. 5. Raise the oven to 425F. Cut the butternut squash in half lengthwise and remove the seeds. Cut into wedges that are about 2cm thick. Arrange the squash on a baking dish preferably with the skin side down and brush with a tablespoon of olive oil. Season generously with salt and pepper. Bake for 25 – 30 minutes, or until the wedges are tender and slightly browned. 6. 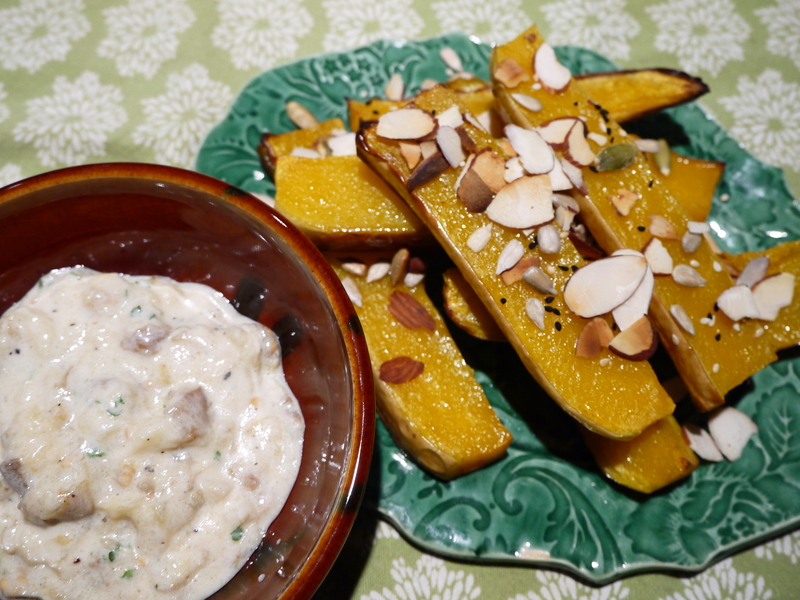 Arrange the squash slices on a serving platter and drizzle with a little olive oil. Sprinkle the nuts and seeds on top, then garnish with the basil. Serve with the sauce on the side.